Enjoying the company of a cat can be therapeutic and extremely pleasant. However, out of too much love or lack of time, a lot of people tend to overfeed their cats, resulting in obesity problems. Unlike dogs, cats are less active and can spend up to 20 hours a day sleeping, which means you need to watch over their diets and ensure they live a healthy lifestyle. After all, although it is said that cats have nine lives, you don’t want your furball to spend each of them battling obesity. Various cat breeds have different target weights, so it is best to check with your vet before labeling your cat as overweight or obese. Keep in mind that certain weight changes are normal if your cat has just had surgery or is older. Other weight fluctuations could be the result of hormonal imbalances, treatments or major stress. Therefore, you should know the signs first. Take your cat to a vet regularly and discuss with the doctor any concerns you have regarding your cat’s ideal weight. If there are clear signs of overweight or obesity, you should also ask the vet for a tailored program for your pet. Feeding your cat dry food is fast and convenient, but this could turn into a bad and harmful habit in the long term. 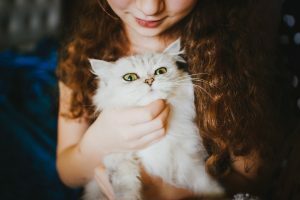 Most over-the-counter cat foods come with zero nutritional values or a lot of empty calories which can quickly lead to overweight and obesity. If you want to watch your feline’s diet, it would be best to switch to wet food or cooked meals instead of regular kibbles. Canned food can prove a great compromise if you don’t have the time to cook your cat’s own meals or opt for premium brands. Most pet owners prefer to fill the animals’ tray with food and allow them to eat as much as they want throughout the day. Although this technique is highly convenient and efficient for the owner’s time, it could prove harmful to the pet in the long term. Most animals won’t stop eating when they are full, meaning they will easily gain weight if they are not under the strict surveillance of their owner. It is also the case with cats that don’t even exercise as much as other pets to consume some of the calories received from eating. Thus, we strongly advise you to teach your cat the responsible principles of eating. Decide on a strict feeding plan and never leave too much food on your pet’s plate. If you’re not around all day to feed your pet at strict hours, you can receive the help you need from an automatic cat feeder. These devices are operated by batteries and will automatically release a pre-established amount of food on your cat’s plate at a certain time. However, most of these products only work for kibbles so don’t forget to add fresh snacks or wet food for a complete and balanced diet. The number one reason why your pet is gaining weight is that it doesn’t exercise enough during the day. Yes, cats are notorious sleepers and lazy creatures, but this doesn’t mean they don’t need their daily dose of adrenaline. 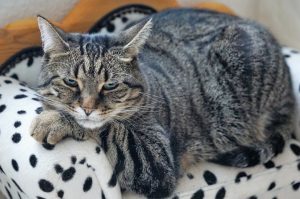 There are several ways to determine your cat to exercise more, but the easiest and funniest way is for you to step in. Just purchase some regular toys and play with your cat for at least 15-20 minutes a day and you’ll see results in less than a month. Remember that cats get easily bored and this is why they need constant stimulation. Invest in some cat tunnels or double beds that will determine your pet to use its claws and imagination to climb. Another way to determine your pet to become more active is to just hide its food bowl in various locations around the house and have the cat guess its location. This will fight boredom and will give you a few minutes of pure fun with your purring friend. Catching mice or other small animals around the house would be another great way to help your cat lose calories and weight. Just make sure it won’t get too far away from your yard. And, if everything else fails, there is always the treadmill solution.